LORE: Rules to the game of life. 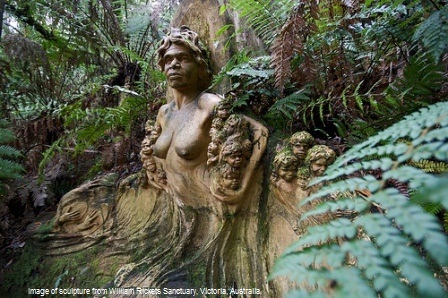 Image of sculpture from William Ricketts Sanctuary in the Dandenongs, VIC Australia. Before I describe Lore, I feel the need to give some background as to how I have come to accept such principles. The following information on Lore is based on my beliefs, my experiences, and the interpretations of the work done by Steve Richards in Dreamtime Healing using Holographic Kinetics. In the early days of my practice, we were visited by those I describe as traditional custodians of the land. It was during some healing sessions while working with clients of indigenous ancestry that the elders made themselves known. I call them traditional custodians, and my perceptions of them are as Aboriginal Elders. At the time I did not understand why, because I do not have any direct connection to the culture or their knowledge. Over time I have developed an understanding as to what was occurring. We are all connected, both throughout the Universe and to the Spirit of Mother Earth. Traditional custodians of the Earth, of all persuasions around the world, have known this for thousands of years and beyond. I do not claim to be an expert in Aboriginal culture. I am going on what I have been told by Aboriginal descendants and what my Guides have taught me. Traditional Lore is connected to "The Dreaming" and provides rules on how to interact with the land, kinship and community. Aboriginal children learned the law from childhood, by observing customs, ceremonies and song cycles. This I believe would be the same for other nations and races. What I have come to understand is that traditional Lore goes hand in hand with the Universal Laws of Existence. Today, before a healing session I acknowledge the traditional elders and our guides. If we are travelling to different parts of the country for our work, we will ask permission to conduct healing sessions in that area. In return, we are sometimes aided by the Elders during the session, and sometimes we are approached to help clear some imbalance in the land. I tell you this with the greatest of respect to the traditional custodians and aboriginal descendants. We are all connected by Spirit. 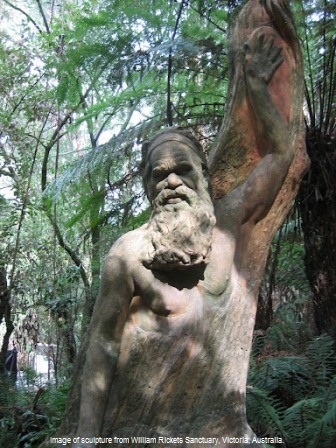 Image of sculpture from William Ricketts Sanctuary in the Dandenongs. If you were to stop for a moment and take the time to examine aspects of your life, you would see all the Universal Laws at work. These laws, as I previously described, are the building blocks of our existence. They interact and create realities exponentially, with cause and effect cycling through time and space attracting the same. Until you understand these Laws and how they interplay to create Lore, you will forever be playing in someone else’s game. This is the concept that has been either lost or deliberately hidden from us. The consequences of the choices we make can cycle throughout eternity until we bring them into balance. Based on these Laws we have the ancient knowledge of Lore which describes the rules to the game of life. I refer to the following list as "Rules", while others would describe them as "Laws". Call them what you may, the fact is they affect every one of us in our daily game of life. Remember, underpinning these rules of LORE, are the Universal Laws of mentalism, vibration, correspondence, cause and effect, transmutation, polarity, rhythm and relativity. Man's created universe of mind is a universe of dimensions. Man's dimensional universe can entrap other dimensions and in turn be trapped by others. All memory of these dimensions is locked in the soul and reflected in the body. Only the creator of the dimension can change it. On all dimensions the most powerful force will subdue the weaker. If you enter a dimension of another through your Free Will (including agreements of entrapment) you are then governed by the laws of that dimension. Everything is alive with Spirit and everything is connected by Spirit. Every living being is a combination of Body, Soul and Spirit. In Holographic Kinetics we communicate directly with Spirit as it can access the body in full knowledge of any imbalances that need correcting. Your Soul is the vehicle by which Spirit experiences life after life. If it chooses, all memory and trauma from past lives is contained in the Soul and genetic memory of the body cells. Everything in existence has the right to Free Will and Choice. Every being has the right to travel through time and space as an observer, free from interference. Intent is more than being clear on what it is you want to manifest or achieve. Remember that thoughts are also energy and your "true intent" behind any action will be subject to cause and effect. You can't hide your true intent. When one agrees to integrate with another, a new entity or dimension is created by the joint agreement and intent of both. The reality of a separate dimension is thus created. For example, when spirit and soul integrate, their agreement and intent can create a body. All agreements are valid eternally. The subtle key to free will entrapment is through the agreement of initiation or ritual, or to invoke external forces. Either through ignorance, free choice or stress, entities from other dimensions will enter your world by way of agreement of contract. In so doing they experience and influence your world. We are energy beings. Energy has the free right to flow as kinetic energy. We create an imbalance by trapping energy through our thoughts and intent creating potential energy. This potential energy can grow into disease or other form of entity. When something is killed before its time, its soul has the right to enter the body of that person responsible for cutting short its life. If you are responsible for the death of an animal or a human or some other life form, then as you have destroyed its vehicle or body, under LORE it has a right to co-exist with your body. Truly recognising Lore, leads on to understanding our rights as universal citizens and our connection to Spirit. This goes far beyond the basic concept of Free Will. We then understand how to deal with inter-dimensional interferences including demonic energies. It then becomes a way of life.